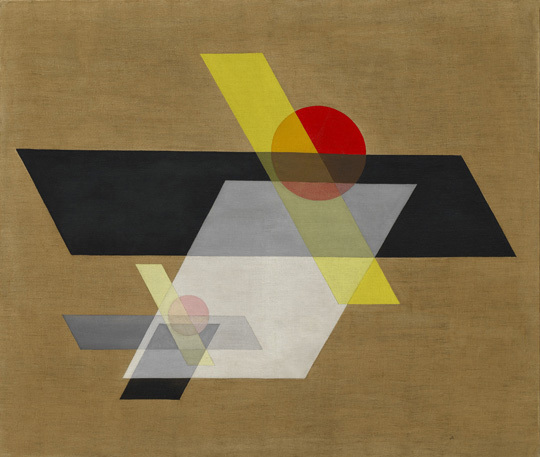 Laszl6 Moholy-Nagy. A II (Construction A 10, 1924. Oil and graphite on canvas, 115.8 x 136.5 cm. Solomon R. Guggenheim Museum, New York, Solomon R. Guggenheim Founding Collection 43.900. © 2016 Hattula Moholy-Nagy/VG Bild-Kunst, Bonn/Artists Rights Society (ARS), New York. László Moholy-Nagy. 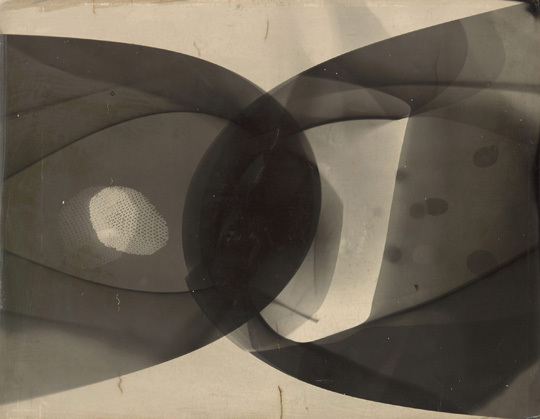 Photogram, 1926. Gelatin silver photogram , 23.8 x 17.8 cm. Los Angeles County Museum of Art, Ralph M. Parsons Fund. 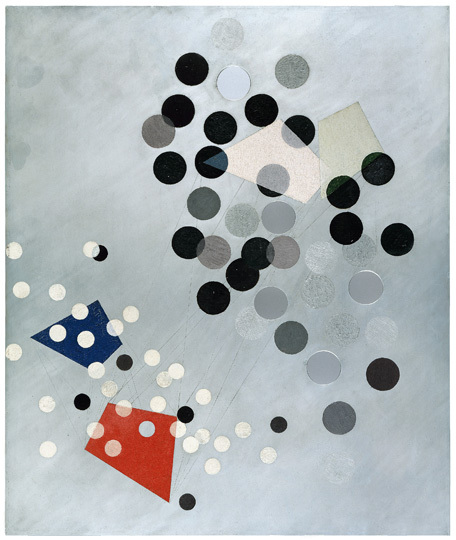 © 2016 Hattula Moholy-Nagy/VG Bild-Kunst, Bonn/Artists Rights Society (ARS), New York. Photo: © Museum Associates/LACMA. László Moholy-Nagy. A 19, 1927. Oil and graphite on canvas, 80 x 95.5 cm. Hattula Moholy-Nagy, Ann Arbor, MI. © 2016 Hattula Moholy-Nagy/VG Bild-Kunst, Bonn/Artists Rights Society (ARS), New York. László Moholy-Nagy. Construction AL6 (Konstruktion AL6), 1933–34. Oil and incised lines on aluminum, 60 × 50 cm. IVAM, Institut Valencià d’Art Modern, Generalitat. © 2016 Hattula Moholy-Nagy/VG Bild-Kunst, Bonn/Artists Rights Society (ARS), New York. 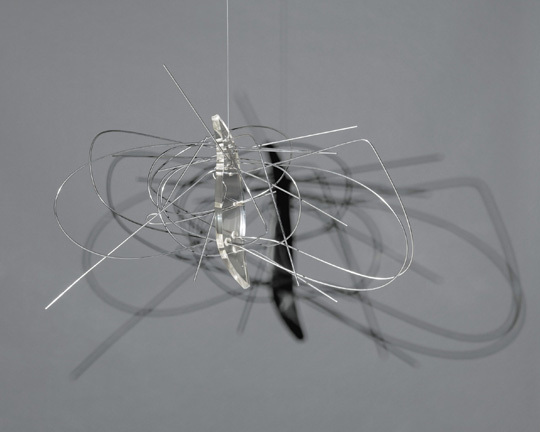 László Moholy‑Nagy. CH BEATA I, 1939. Oil and graphite on canvas, 118.9 x 119.8 cm. Solomon R. Guggenheim Museum, New York, Solomon R. Guggenheim Founding Collection 48.1128. © 2016 Hattula Moholy-Nagy/VG Bild-Kunst, Bonn/Artists Rights Society (ARS), New York. László Moholy-Nagy. Space Modulator, 1939–45. 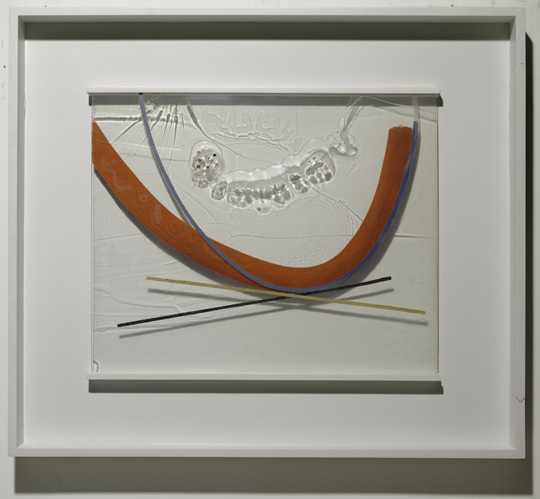 Oil and incised lines on Plexiglas, in original frame Plexiglas: 63.2 × 66.7 cm; frame: 88.6 × 93 cm. Solomon R. Guggenheim Museum, New York, Solomon R. Guggenheim Founding Collection 47.1064. 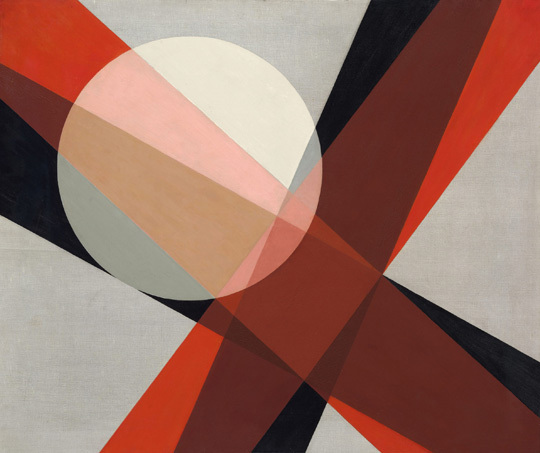 © 2016 Hattula Moholy-Nagy/VG Bild-Kunst, Bonn/Artists Rights Society (ARS), New York. László Moholy‑Nag. 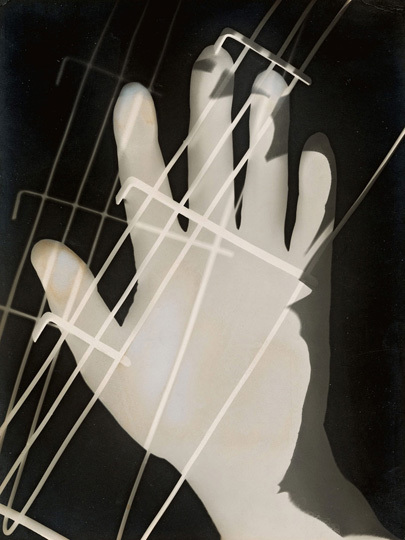 Photogram, 1941. Gelatin silver photogram, 28 x 36 cm. The Art Institute of Chicago, gift of Sally Petrilli, 1985. © 2016 Hattula Moholy-Nagy/VG Bild-Kunst, Bonn/Artists Rights Society (ARS), New York. László Moholy‑Nagy. B‑10 Space Modulator, 1942. Oil and incised lines on Plexiglas in original frame Plexiglas: 42.9 × 29.2 cm; frame: 82.9 × 67.6 cm 42.9 x 29.2 x 6 cm. Solomon R. Guggenheim Museum, New York, Solomon R. Guggenheim Founding Collection 47.1063. 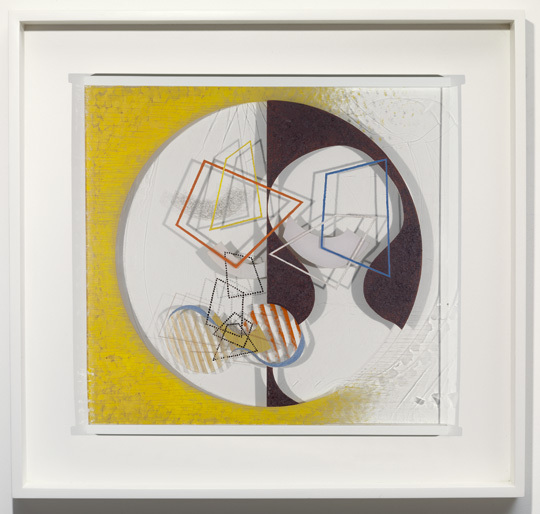 © 2016 Hattula Moholy-Nagy/VG Bild-Kunst, Bonn/Artists Rights Society (ARS), New York. László Moholy-Nagy. 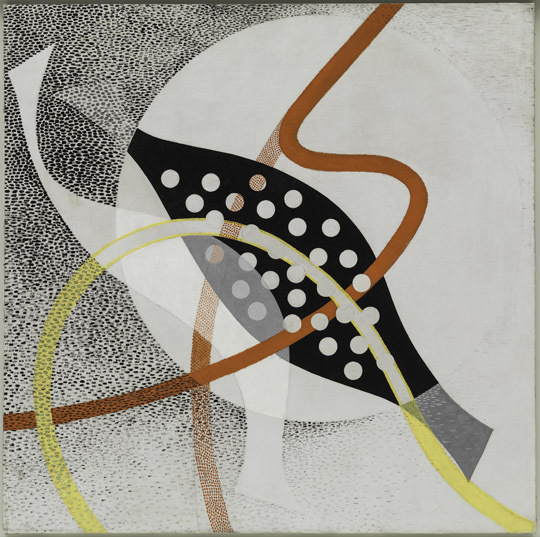 Papmac, 1943 Oil and incised lines on Plexiglas, in original frame Plexiglas: 58.4 × 70.5 cm; frame: 91.1 × 101.9 cm. Private collection. © 2016 Hattula Moholy-Nagy/VG Bild-Kunst, Bonn/Artists Rights Society (ARS), New York. László Moholy-Nagy. Dual Form with Chromium Rods, 1946. 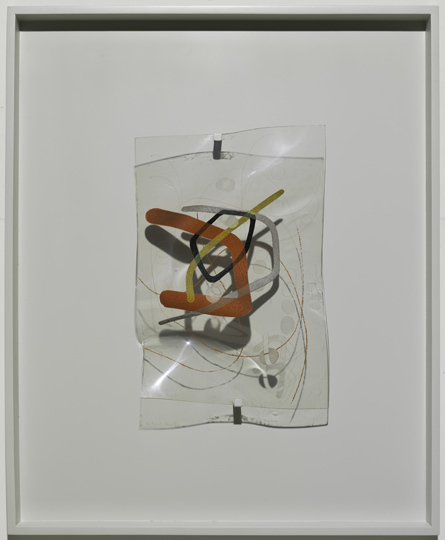 Plexiglas and chrome-plated brass, 92.7 × 121.6 × 55.9 cm. Solomon R. Guggenheim Museum, New York, Solomon R. Guggenheim Founding Collection 48.1149. © 2016 Hattula Moholy-Nagy/VG Bild-Kunst, Bonn/Artists Rights Society (ARS), New York. Photo: Kristopher McKay © Solomon R. Guggenheim Foundation, New York. László Moholy-Nagy. 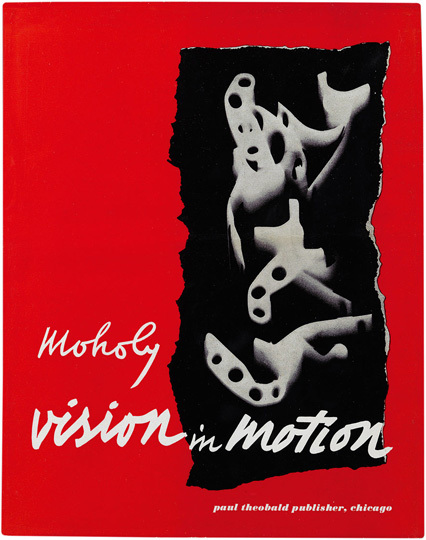 Cover and design for Vision in Motion (Paul Theobald, 1947). Bound volume, 28.6 × 22.9 cm. The Hilla von Rebay Foundation Archive. © 2016 Hattula Moholy-Nagy/VG Bild-Kunst, Bonn/Artists Rights Society (ARS), New York. László Moholy-Nagy. 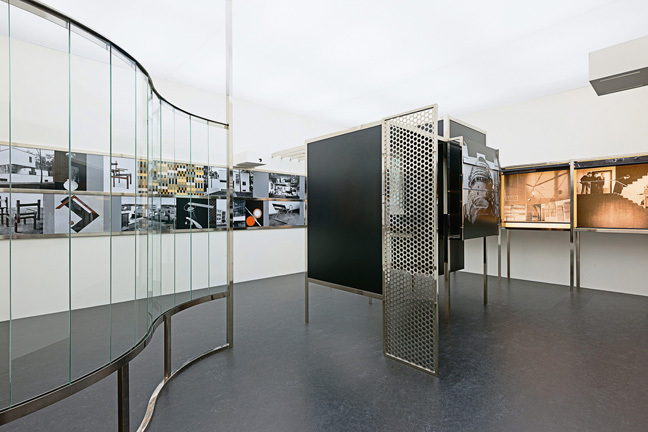 Room of the Present (Raum der Gegenwart), constructed in 2009 from plans and other documentation dated 1930. Installation view: Play Van Abbe – Part 2: Time Machines, Van Abbemuseum, Eindhoven, April 10–September 12, 2010. Mixed media, outer dimensions: 442 × 586.8 × 842.8 cm; inner dimensions: 350 × 556 × 812 cm. Van Abbemuseum, Eindhoven. © 2016 Hattula Moholy-Nagy/VG Bild-Kunst, Bonn/Artists Rights Society (ARS), New York. Photo: Peter Cox, courtesy Art Resource, New York.